Nineteen UIC seniors are helping create a new brand and logo for the University. When Julia Jouravel graduates in May, she and her classmates will leave their mark at UIC. Jouravel and 18 other seniors in the College of Architecture, Design, and the Arts are creating a new identity system — including a new logo — for the UIC campus. The students are part of a yearlong senior practicum course, Design 440: Design Thinking and Leadership, led by faculty members Cheryl Towler Weese and Meghan Ferrill. UIC design students created UIC’s current logo more than 20 years ago, Towler Weese said. 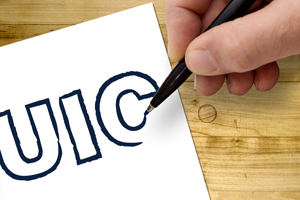 Michael Redding, executive associate chancellor of public and government affairs, engaged the Design 440 students to work on a new identity to reflect UIC’s growth over the past two decades. The new identity system will create a cohesive look that stands out, Ferrill said. Students began working on the identity system in the fall, touring campus, researching its history and accomplishments, and interviewing key stakeholders — administrators, faculty, staff, students, alumni and community members. They presented their findings in a 35-page report to the Integrated Marketing and Strategic Communications Advisory Council, then began redesigning the campus logo. “The impact is going to be significant no matter what we do,” Jouravel said. “This is something that people will identify UIC with for years to come, and we hope that people will have more pride and greater ties to UIC as a university. Read more at the UIC News Center.